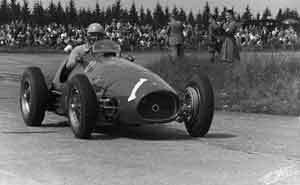 The 1953 season was a head-to-head battle between the Ferrari and Maserati factory teams and, as usual, there were four cars from each firm at the Nurburgring: Gordini came with three cars, Connaught with three and the field was boosted by a large number of the local Formula 2 machinery, including AFMs, Veritas-Meteors, BMW Specials and even an EMW. There were no HWMs on this occasion but British interest was kept up with a trio of Cooper-Bristols and a Cooper-Alta being driven by Stirling Moss. The battle, however, was much as usual although Maserati was missing Froilan Gonzalez who had been injured in an accident during a sportscar race in Lisbon the previous weekend. His place in the team was taken by Emmanuel de Graffenried. Ferrari's Alberto Ascari was on pole position with Juan-Manuel Fangio's Maserati alongside and the front row was completed with the Ferraris of Nino Farina and Mike Hawthorn. Maurice Trintignant did a good job in his Gordini to out qualify Gigi Villoresi (Ferrari) and Felice Bonetto (Maserati) on the second row, while the third featured the Maseratis of Onofre Marimon and de Graffenried split by the Gordinis of Jean Behra and Harry Schell. At the start Fangio took the lead but Ascari was soon back in the lead and he had a 10-second advantage at the end of the first lap. Fangio had Hawthorn on his tail and in the course of the second lap the Englishman moved ahead. Fangio fought back and the two dueled. Ascari had a lead of 40secs when he lost a wheel at Tiergarten. This was a blow but he was able to get the car to the pits and rejoin after repairs had been made. While this was happening Farina moved up to challenge the dueling Fangio and Hawthorn. In the course of the eighth lap Farina took the lead. Fangio managed to get clear of Hawthorn. Ascari was trying to catch up but his car was not handling well and it was decided that he would switch cars with Villoresi. This was achieved and Ascari set a series of fastest laps. On lap 15 however the Ferrari began smoking and he had to settle for eighth place. Farina ended the race over a minute ahead of Fangio with Hawthorn 38 secs behind the Argentine driver. Fourth-placed Bonetto was seven minutes behind Hawthorn while the top six was completed by de Graffenried and Moss, but both were a lap behind the winner.